... is a free eight chapter workbook covering all aspects of public art process. ... tests steps for developing creative process and technology for new public art. ... serves as a resource for responsible and innovative artists who work and exhibit in public spaces. ... is suitable for artists of all ages, genres and cultural backgrounds. The production of this workbook has been supported by District of Columbia Commission on the Arts and Humanities as a part of Summer Youth Employment Program in Edgewood in Summer 2009. 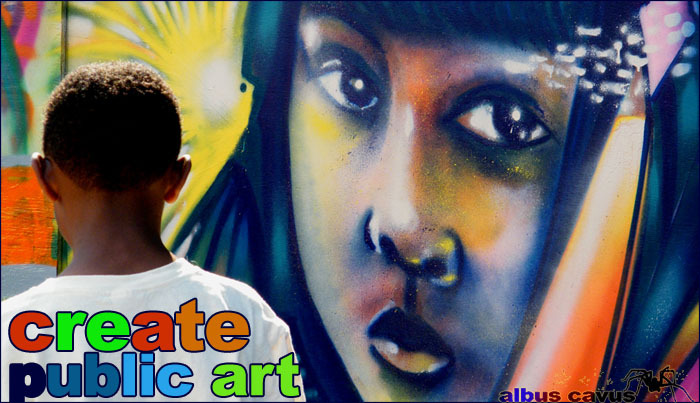 During this extensive mural project, Albus Cavus artists conducted workshops for the participating young artists and have developed the approach to creating art in public space presented in this publication. "Going Public: Guide to Creation Art in Public Space" has been a community project that brought together a wonderful group of artists, teachers and young enterpreneurs who share the common goal of transforming public spaces through creative and community-building process. This effort has been coordinated by Peter Krsko. The graphic design and layout of the publication was completed by Tim Rodgers Jr.